Small, good sound with different headphones, not much extra to buy. Mp3 display on remote. Headphones tinny. Remote can be hard to read. Mp3 slow to boot (common with alot of players). Last year I had been looking for an mp3/CD player to use in my car for long trips. Mp3 is perfect for car use unless you have a perfectly quiet car (I don't) and the playing time reduces the number of CD's you have to carry and reduces the added risk of damage to the origional CD's. I ended up buing a car stereo that plays mp3 disks. A couple of months ago my stereo was stolen after I had left the faceplate on. (In my buisness I use mp3 cd's for background music on a shelf unit) Anyway I ended up desiring a replacement but then decided on a portable instead of another car mp3/CD deck. It turns out that the iRiver was it and it has a line out. I have not been too impressed with most portable CD players as over the years the sound quality has actually gone down a bit. As for mp3 I have only found their use for casual background listening as more direct scrutiny shows up the mp3's compression shortcommings. I ended up with the iRiver after much searching for critical reports on the sound of all portalables, unfortunately actually trying out these portables is not always possible. The clincher was from a headphone company I respect and does not sell other non headphone equipment, which seemed a very appropriate recomendation. Ok here it comes. I think this is the best portable I have ever come across. The sound on CD's does not grate and even the mp3 is passable. The earbuds are the only thing I can complain about as they are tinny and not worth the time to try or even get those difficult little cover socks on. What is nice is you don't have to buy a wall wart, it comes with rechargable batteries, it has an LCD remote and has an extra AA battery pack to extend playing time. The only things I would get exra would be a decent pair of headphones, a car adapter and a decent carrycase. What about the sound again??? It's not a home stereo but it is close if you use good headphones. The FM tuner is decent and the remote use has a learning curve to it and can be hard to read. Other than that I enjoy it. A big surprise to me. As for headphones my home set are Grado, but I have read that Koss and Sennheiser make good small portlables. I am thinking of the Koss KSC-50's. This is the best cd player i've gotten after years and years of going from one player to another. These will bring you everything, almost. The weaknesses are that the bass is a little low, not a problem if your an enthusiast because the bass is still acceptable, clear, and good. The other weakness is that it doesnt go loud with most earphones. This is made up by Iriver's earbud earphones, the loudness is AWESOME. The earbuds, surprisingly, deliver such loudness i can barely turn it to max levels. I recommend this product to anyone who wants their money's worth and loves good quality things. Thumbs up. When I ride my bike with the player, it sometimes skips on regular audio CDs. MP3 CDs aren't a problem though. For regualr audio CDs, I just use my Sony G-Protection player. This is a great player. 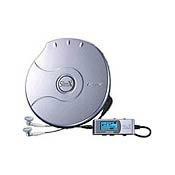 I think that iRiver has the top-of-the-line mp3/cd players available on the market. It has every feature you'd want and more. And it's so small. Contrary to popular belief, I actually thought the remote is very easy to use and get used to. I'm so glad I have this. The first Rio mp3/CD player, I forget the name. My old Sony broke, and I had heard good things about the IMP/350 so I bought one. I have never used the earbud headphones that come with it. I have a pair of Bose Tri-Port headphones. They sound excellent with the cd player. I am impressed by the ability to tailor the player to your specific likes and dislikes. I would pay twice as much as I did in a second for this cd player. Almost every cd player on the marked due to my job. Good sound quality from factory headphones, but even better with aftermarket headphones. Unskippable, long battery life. Very slim and lightweight. Go buy one. Display bright and easy to read. Wired remote takes some time getting used to.